More about Lars' Own Wild Swedish Lingonberries Lingonberries are a staple food in Nordic cuisine, as the wildberries grow rampant across the beautiful Lapland landscape. These Lars' Own Lingonberries have been handpicked from the forests of Sweden, stirred with sugar, and jarred to preserve their all natural sweet and tart taste. There are countless ways to use lingonberries, but some traditionally Scandinavian serving suggestions are atop pancakes, pork roasts, or meatballs. The lingonberries also make a great complement to Thanksgiving turkey and are delicious with yogurt, oatmeal, ice cream, cake and soft cheeses. See secondary image for Nutrition Facts. The jam/sauce is the best, perfect on toast, with fish, chicken, everything!. We used this on our traditional pancakes. My family loved this. Not too sweet. These preserves have a good mix of tart and sweet. They do contain more sugar than I would like, but I do not find them too sweet. They have a nice, authentic, "pulpy"consistency, not too gelatinous. On the container it says that these lingonberries are "stirred with sugar." There sure are stirred with sugar - lots of it, I mean way too much!!! 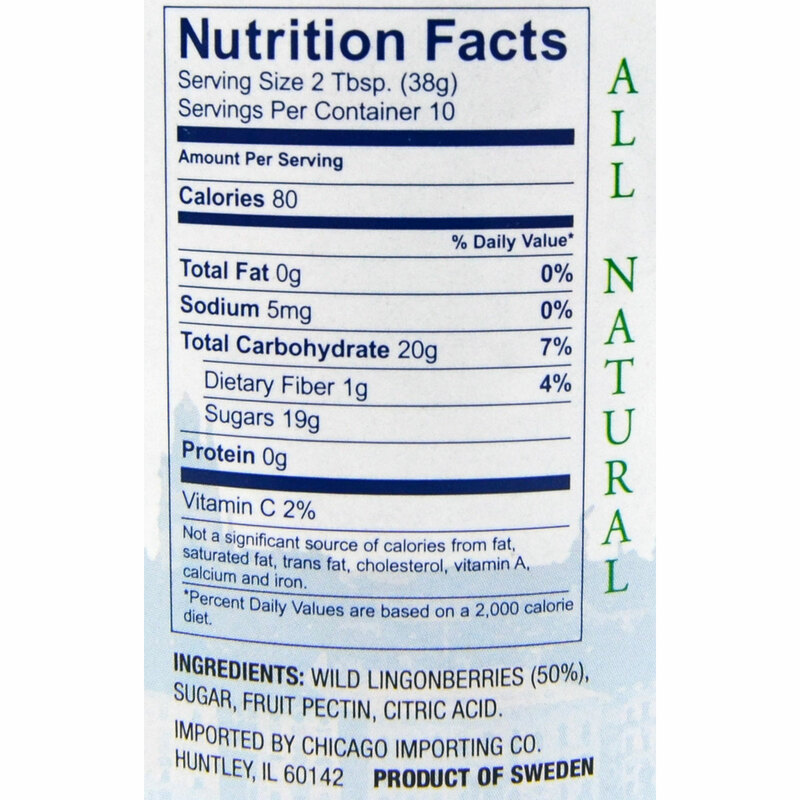 A serving of these particular lingonberries is 38 grams or 2 Tbsp (tablespoonfuls), of which 50% or 19 grams is SUGAR! According to the label on the container, lingonberries are "sweet and tart." These sure are sweet - nauseatingly sweet -with no trace of tartness I was able to detect. These lingonberries do not taste like the lingonberries I had in my youth in Finland or on my recent visit to there. These lingonberries are disgusting junk food - only in America or what??? Please reduce the amount of sugar. Lingonberries are tart and bitter and sassy. I know what I'm talking about. On a trip to northern Finland an Sweden I tramped over vast areas of forest and tundra eating the tart little lingonberries, which were everywhere. I returned home with a jar of simple preserves of the fruit that we made ourselves. 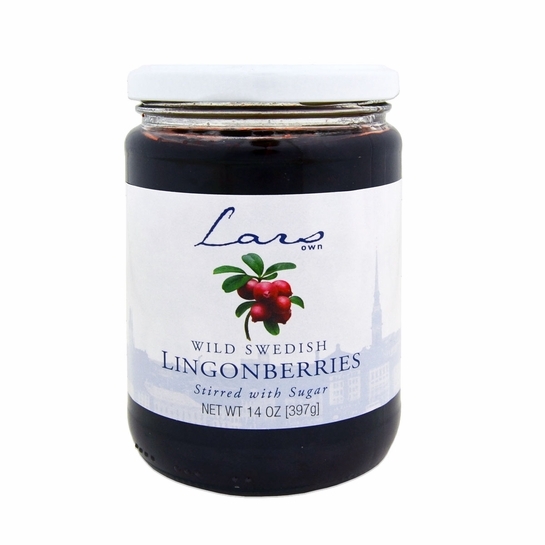 Iâ€™m so pleased to have purchased your Larâ€™s Own Wild Swedish Lingonberries to replace my long gone own wild Finnish ones. What else would I fill my rolled up thin pancakes with? And oh what memories they evoke! Excellent product! These are so good. I like them on Crepes and even ice cream. I enjoyed how the berries are whole and the taste is tangy and sweet. I hope Finnstyle continues this item. The best lingonberry jelly on the market! Several years ago I had purchased this at Christmas time from another retailer. Loved it. Then I couldn't find it any more. I tried other brands & none had the perfect balance of tart & sweet like the Lars' Own. It is also not stingy on the fruit. There's just as much fruit as there is jam. I periodically searched the web for this & am delighted that Finn Style now carries. And at a great price. They make great hostess gifts as well. ConsNo con that I can think of. Too delicious for words.